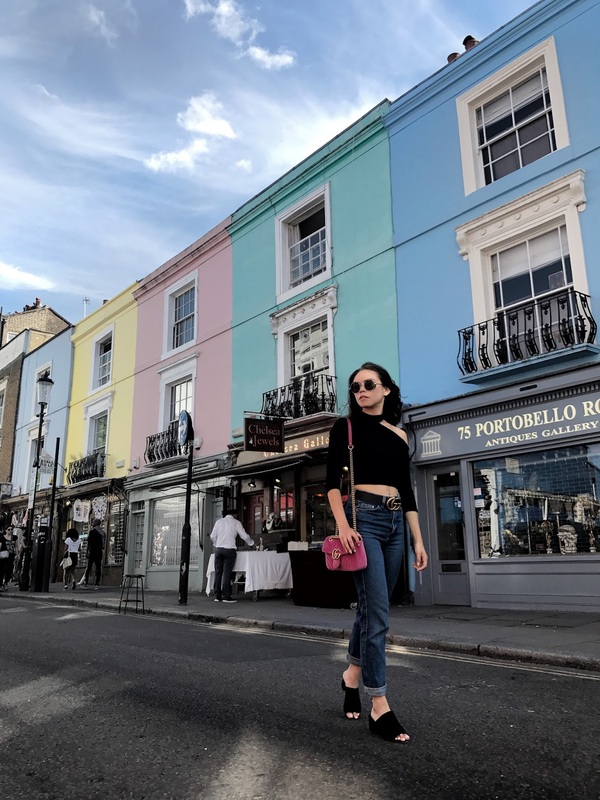 London was the last stop of our Europe trip, and today I'll be sharing one of my favourite districts in London -- Notting Hill. 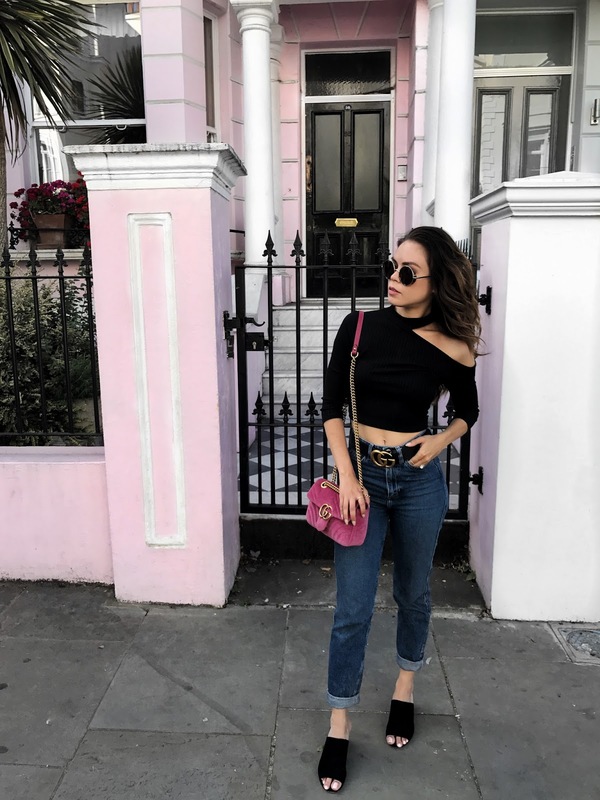 If you like colourful houses, pink doors and quaint neighborhoods, you'll love Notting Hill. Whenever I think of Notting Hill, I remember the movie with Julia Roberts and Hugh Grant, the cute 'Rom-Com' classic. In my opinion, Notting Hill is even prettier than depicted in the movie. Portobello road was on my must-do list for Notting Hill. 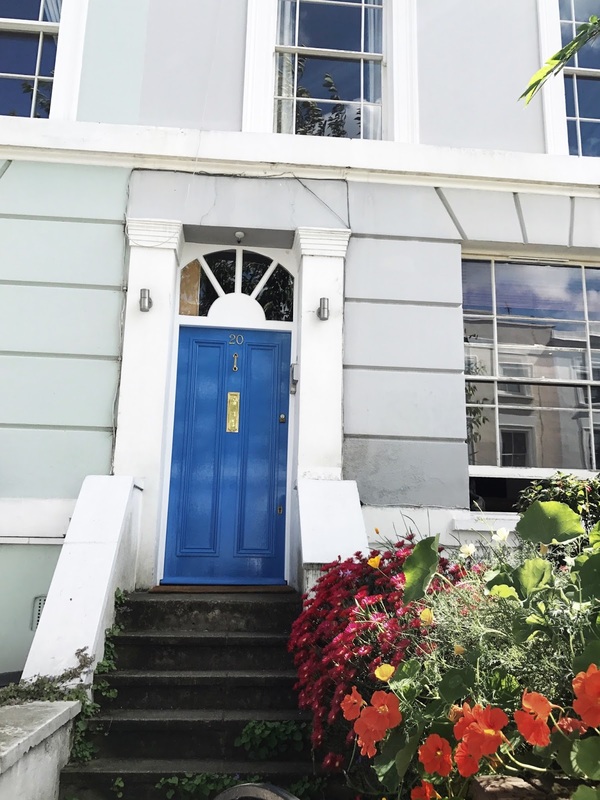 While I enjoyed the Portobello Market Street and the little boutique shops, I enjoyed venturing off Portobello Road even more because that's where I found the prettiest and pinkest houses and doors. I wasn't completely sure how to pack for London because the weather is similar to Vancouver - completely unpredictable. Thankfully we had mostly sunny days and I was able to break out this unique crop top from Sans Souci. The cut outs and off shoulder detail takes this basic outfit from boring to bomb! I'm so glad the hubby and I were able to explore Notting Hill and I can't wait to be back. Notting Hill looks absolutely charming! And your outfit is so perfect! I love that crop top! Oh Notting Hill looks like the most charming place! Everything is so cute! I definitely want to paint my house pink too after seeing all these pretty houses! You look stunning! I love this look and I'm obsessed with your hair! Gorgeoussssssss photos love!!!!!!! Love the bag with the background!!! I went to London years ago when I was in high school and I so want to go back. You photos are so fun! And love the high waisted jeans with the Gucci belt. Gorgeous! I love London, great pics! You look great in this casual chic outfit! Gorgeous pics. Love this outfit. I love the photos. The backdrop was perfect for the outfit and that fabulous bag. Hi Rina, Notting hill is my favorite part of London! Of course, after The Selfridges and Oxford Circus. You look gorgeous in this cropped top and jeans! I love it. Yass i'm obsessed with your outfit! So simple but chic! Notting Hill is so cute! I love the colorful buildings and houses, especially the pink ones! OMG, I am obsessed with this look! Such an edgy and cool look with a feminine pop of pink - so gorgeous. And you even compliment the buildings :) I need to visit Notting Hill! Beautiful shots and love your top so much! How wonderful you went to notting hill, it is so pretty and definitely a spot to go whilst in London. Notting hill looks so amazing! The buildings are so cute! And I love the cut out detail on that crop top!! LOVE your bag and your belt! You look so chic! The pink buildings are so cute! Love your hair! Notting HIll is so pretty. What a cute outfit! You're rocking that Gucci belt & bag! Love those mules too btw! Nottinghill is definetly one of the prettiest places I saw so far. Lovely and your casual Outfit is simply perfect. Yet the classy Details such as this lovely bag make it so eyecatchy. Notting Hill is so pretty. I love your crop top and your stunning blog. I love Notting Hill! You look gorgeous in your outfit. I love the simplicity of all the black in this look and then the gorgeous pop of pink! So chic. Love your outfit, reminds me so much of Jenn Im. And Notting Hill is always beautiful, perfect for photoshoots. What a pretty road, the door with the flowers and bike is the nicest. Love what you're wearing, the top and Gucci accessories!!! Great outfit and photos! I love your bag and belt.